It was hopefully the itchiest job that we'll have to do, but with fall coming up and our water heater being in an outside closet, it was time to put a water heater blanket on. I learned that a water heater blanket isn't a blanket at all, but essentially insulation with plastic on one side - hence the itchiness. 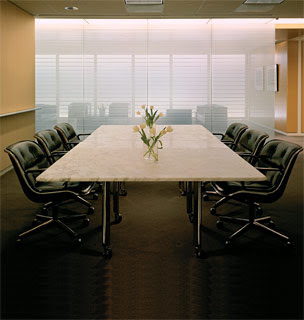 Overall it was a pretty easy job that didn't take too long that should be a good investment in the long run. 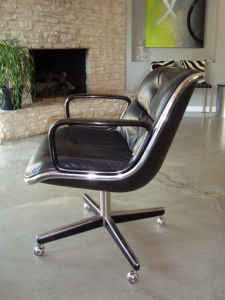 We picked up a new chair for the study from our favorite store, craigslist. 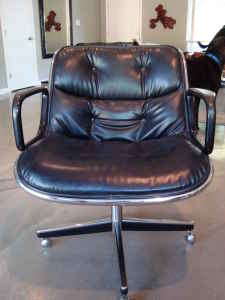 It's a Knoll Pollock Executive Chair. 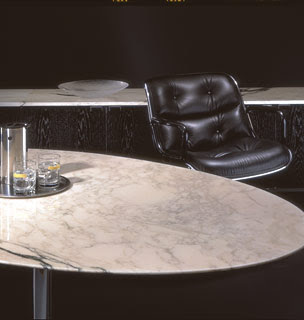 From Knoll, "Charles Pollock's 1965 executive chair, now considered one of Knoll's most memorable designs, features an aluminum rim that supports the chair both structurally and visually." We have no need for another stereo/record player. And we really don't have room for one. But if I ever see one of these in person, I'll buy it in a heartbeat. I knocked another item off the inspector's list; I cleaned all the debris off the roof and out of the gutters. I found a good reason to wear gloves when cleaning the gutters (besides not wanting to get your hands all gross - which was my reason), there may be a fire ant colony living in the leaves. 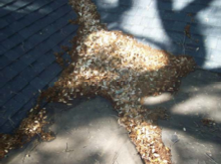 The gutters were packed to the brim with leaves and gunk, so while one item is checked off, I have to add "Put leave guards on gutters" to the list. It's been a rather laborious Labor Day weekend. Part of that was putting in a toilet paper holder in the master bath. 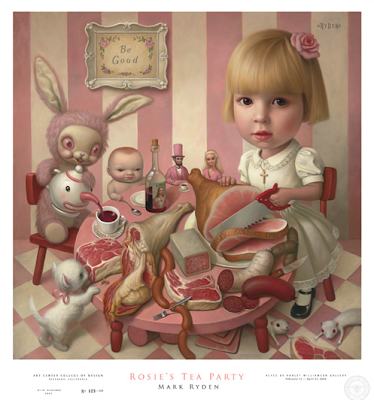 If I had to guess, I would say one of Rachel's least favorite things in the house is one of my favorite; this: It's a print of Rosie's Tea Party by my favorite working artist, Mark Ryden. Well, Mark just had a new show, The Tree Show, where he had slightly less creepy, but still equally gorgeous, prints, including General Sherman: I was able to find a General Sherman print for a steal and snatched it up. So now Rachel's a little happier and there's a little less pink in the house - which is actually good, Rosie's Tea Party didn't really fit in the new house, color-wise or theme-wise, and I've already found the perfect place for General Sherman. The above image is from our initial inspection. Notice the big red pointy arrow? 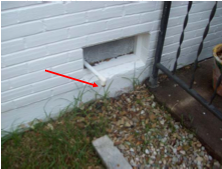 Our AC condensation drain was too close to the house and could (after hundreds of years) start eroding the foundation. It's one of those things that shows up in an inspection that doesn't need to be fixed right away (actual quote from inspector), but it's an easy fix so I thought I'd give it a go. A bit of tubing and a little bit of sawing and the drain is the suggested 5 feet away from the house (5.5 feet actually). We're lucky enough that right in front of the drain is a bit of a rock garden - the transition from the back patio to the grass. So I didn't have to do any digging; I simply pushed some rocks away and then pushed them back over the pipe. One more thing off the list.